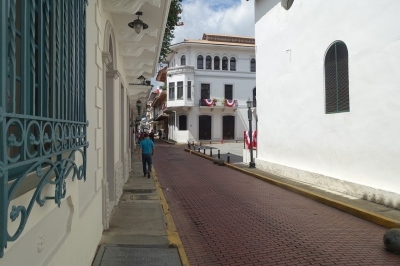 The Colonial Transisthmian Route of Panamá (Ruta Colonial Transístmica de Panamá) is part of the Tentative list of Panama in order to qualify for inclusion in the World Heritage List. "It is a serial property which comprises 5 component parts, several of which already have been inscribed on the World Heritage list[.]" Executive summary: Of the 5 proposed components 3 are already inscribed as Panama and Portobelo and San+Lorenzo. This leaves the two roads connecting the Caribbean and Pacific coast as sole new addition. I effectively ticked this off on my short visit to Panama by visiting Panama and Portobelo. I even made an effort in Panama to follow the road a little bit in downtown. I really don't think serial combinations consisting primarily of already inscribed sites should be given any consideration. This does not belong on the list and is well covered by the already inscribed sites. Visiting Panama already gets you there, so there is little to add here.